Just say you were very pregnant and your partner had taken your older child down to the shops. You’re home alone and lo and behold, your waters break. Argh. Imagine your labour progresses so quickly that you find yourself touching your baby’s head in a matter of seconds. This is the situation New Jersey mum Melissa Dawson found herself in on the day she took DIY to a whole other level and delivered her own baby girl. 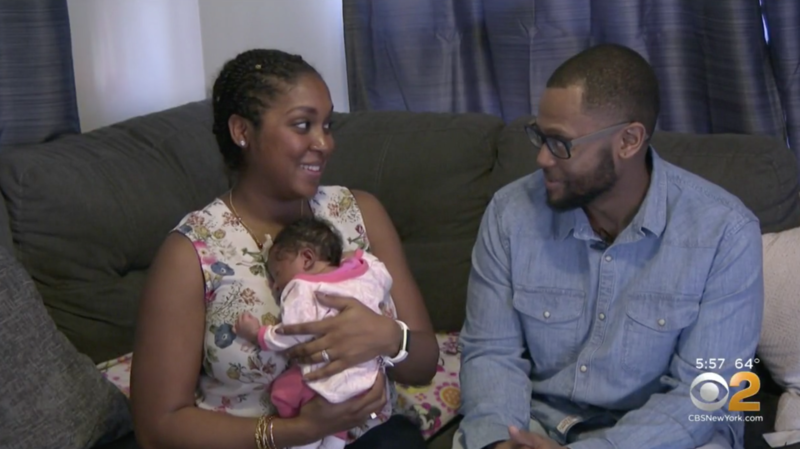 “Melissa says going into labor and delivering baby Bria Belle last Thursday was the most frightening, yet exhilarating moment of her life,” CBS Local reports. “It was the most … panic-driven experience I’ve ever had,” Melissa told the news outlet. Doula vs midwife: what’s the difference? And honestly? It sounds pretty gosh-darned freaky and we can’t imagine we’d be a total birth boss like Melissa. “It’s coming, it’s coming, it’s coming,” the labouring mum can be heard screaming in audio captured by a nanny cam in her older child’s bedroom. “Oh my god, the baby is coming,” a panicked Melissa says she told her husband Gregg over the phone. “She said, ‘You need to get home right now! '” Gregg confirms. “Oh my god, the baby!” Melissa screams in the nanny cam audio. “I feel the head! I feel the head!” she shrieks. Yowch! She quickly wrapped her newborn up and … took a selfie! Go mama! Fifteen minutes later, an ambulance crew kicked down the family’s front door and came to Melissa’s aid. Several minutes after that, her hubby arrived home to meet his new daughter. “I still can’t believe it happened to me,” Melissa admits, but luckily she’s got the selfie … and the baby to prove it!